Wipaq offers solutions for the most difficult issues that you face on a daily basis as someone who manages a large number of people. Forming a line is never so easy as is achieved by using the stainless steel post and rail steel rails. Made of sturdy steel, it lasts longer and is a rust proof body even to leave it outdoors. This gives the right assistance to crowd control and is very effective at that. Compare the quality, standard options, and thick-wall construction and you will see that our AdaptaRail system is the best valued Post and Rail Solution available. The AdaptaRail Post comes standard with the following: 2” Diameter vertical tube, top cap, railing adaptor fittings to accept 2” diameter tube rail, welded floor flange and a satin stainless steel finish. The AdaptaRail system may be ordered in a variety of different configurations. Please call for details. The AdaptaRail may be ordered in heights of 36” or 44”. The AdaptaRail Post is available for either a single or double rail configuration. Single rail systems use one railing adaptor fitting per post while double rail systems use two railing adaptor fittings per post. Railing adaptor fittings are attached to the vertical post with a concealed nut and bolt for a seamless look. Rail tubing can be cut to any size needed. Send us your sketches and drawings and we can configure the layout for you or assist with your own ideas. The AdaptaRail posts are available with 5” or 7” diameter welded floor flanges. 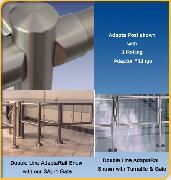 AdaptaRail is available in satin stainless finish (standard) or Polished stainless finish. Other materials and finishes are available. Please call with details for a quote. Hayward Turnstiles Post and Rail system is a custom tailored crowd control solution built to our customer’s space requirements. Two inch diameter stainless steel posts with affixed adaptors allow easy insertion of two inch diameter stainless steel rails. All posts are welded to a five or seven inch diameter floor mounting flange and can be finished with a decorative stainless steel flange cover.